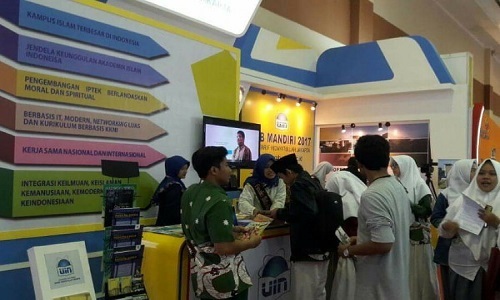 UIN Jakarta Campus, UIN NEWS Online – A total of 4,128 participants of the Inter-Islamic Recruitment (UM PTKIN) has their selection process at UIN Jakarta on Tuesday (5/23/2017). It was conducted nationally with 56 PTKIN throughout Indonesia. In this comprehensive written test, PTKIN offered only a number of religious studies programs. At the selection time run down, UIN Jakarta started at 07.30 WIB for Sciences, Social sciences, and mixed discipline Sciences. Participants were spread and did the test in several faculty buildings on campus 1, including the Auditorium building and the Madya Hall. 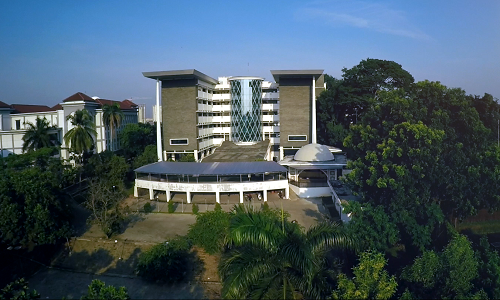 In this selection time procedures UIN Jakarta involved at least 400 people who supervise the selection test process consisting of lecturers and employees. The written test implementation at UM PTKIN in UIN Jakarta not only used Paper Base Test (PBT) model, but also Computer Base Test (CBT). CBT Participants amounted to 160 people were having their test at the Center for Integrated Laboratory (PLT) building. There was a sense of apprehension on the process because technically the exam through CBT did not encounter any constraints on the building but the electric cut off would took place at the time during the test. The PBT participants did not face any problems, not from the availability of the test script (NSU) nor the test answer sheets (LJU) availability. However, on the answer sheets (LJU) column for PTKIN, the number for the code was 318, yet the number 8 was not available that must be made by participants by making additional black rounded using 2B pencil. The participants then were asked to manually create the number them self and rounded it up. On the Independent Examination written test of PTKIN, the test took place in two sessions. The first session was about material in the form of Basic Capability Test (TKD) and second session was in the form of Field of Sciences (IPA), Social Sciences (IPS) and Mixed Discipline of Sciences (IPC). Based on the recorded data, the total number of registrants this year for PTKIN Independent Examination tests in a national range reached of 185,330 participants. From that total number, participants who chose UIN Jakarta reached 10,397 with 30 courses offered. The number consists of option 1 with a total of 5,227 people, option 2 with the total of 4,202 people, and option 3 of 968 people.